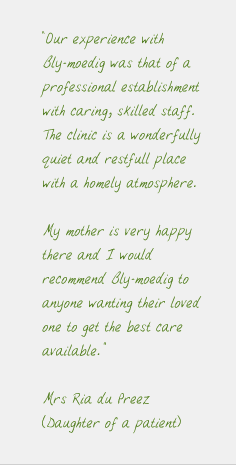 Bly-Moedig is a Psycho-Geriatric Clinic. Our purpose is to look after patients in a dignified way and to provide them with a safe structure to function in. We would recommend you visit our facility to experience the well organized and professional Clinic that we have established over 30 years. We are situated a couple of minutes outside of Pretoria in a warm country environment. See our contact details with detailed location instructions and a map. • We specialize in Alzheimer's and other long term psychiatric care, as well as people with physical disabilities.